We can take care of all your landscaping needs. From the first consultation, to plan design, and landscape project completion. 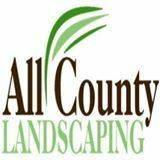 All County Landscape is your one-stop shop for amazing landscapes. Artificial Turf, Grass is a Great Product that has been advancing since it was made years ago. The new Artificial Grass looks and wears better than ever. Pets love the Artificial Turf and so do the pet owners. Water features, ponds, fountains, ALL COUNTY LANDSCAPING would like to integrate your interests and desires with the beautiful accompaniments of nature. Whether it's waterfalls or fountains, colorful fish and water lilies, a pond or a stream, we can help you create a little bit of paradise in your own backyard. Design details are important to us, starting with the general composition of the garden right down to the exact detail and location of plants and material selections. The natural beauty of your property and your personal style are always showcased in our designs. Irrigation: Our team of season professionals can install and service a customized irrigation system that will help reduce plant loss and stress, lower your utility bills, For those of you who already have an irrigation system in place, we provide Spring start-up services, as well as SPRINKLER REPAIR and preventative maintenance. When you're looking for great landscaping near San Luis Obispo Area and Northern Santa Barbara County, you'll be impressed by the quality of service by All County Landscaping. You won't regret how nice your property will look after a professional landscaping by the A+ team at All County Landscaping. All County Landscaping has what you need! When you want your yard to look elegantly designed, you'd be smart to call upon the professionals at All County Landscaping. Servicing: San Luis Obispo and Santa Barbara Counties. Copyright ©2019 All County Landscaping. All Rights Reserved.